ETX Capital is one of the oldest FCA Authorised & Regulated Forex brokers, owned and operated by Monecor (London) Limited. They were founded in 1965, and are located at: One Broadgate, EC2M 2Q​S, London, United Kingdom. Contact phone number is +44 (0) 207 392 1494, and their email is newaccounts@etxcapital.com. ETX Capital offers their investors a choice of the MetaTrader 4 platform, and their own TraderPro platform. Spread Betting, CFD’s Forex, Shares and Crypto Currencies are all available on hundreds of underlying assets. The difference between a great broker and a mediocre company, is how much they invest in their trading software. It is safe to say, that many clients investing with this broker are there because of the Trader Pro platform. You will notice when reviewing ETX Capital, that their markets commentary and news wire service is up to date. A benefit of using an established Forex broker like ETX, is that they have a strong support team. Minimum deposit for a new trading account is only $100. 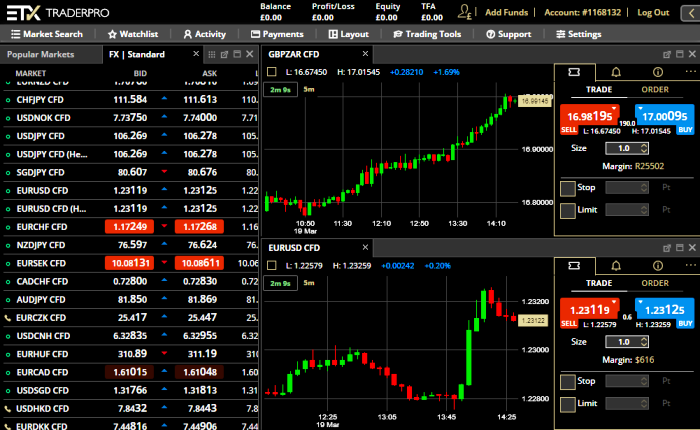 You can also setup a free demo trading account, alongside your regular account, see here. When the scam broker investigator looks at a Forex broker to determine if it is a scam or a legitimate broker, we want to know if they are authorised by the FCA in the United Kingdom. What makes ETX Capital unique is their regulation status. While other brokers may be registered with the FCA, ETX Capital is also regulated by them. Their Financial Services Register number is 124721, and they are a member firm of the London Stock Exchange. ETX Capital takes complaints seriously due to their FCA license, and they use an external Financial Ombudsman Service to resolve any issues traders may have. Traders at ETX Capital receive a higher level of protection with their accounts, because of the Financial Services Compensation Scheme. Trader’s funds are insured up to £50,000. Accounts are all segregated and held in German or British banks, with investment grade ratings. All these protections are only given to clients who trade FCA regulated products. New investors in Forex & Binary Options now have many licensed brokers to choose from. ForTrade is a popular CFD broker licensed and authorised by FCA. You should try their custom trading platform, which is very easy to use, look here. CM Trading is a South African broker that is licensed by FSB, see here. Their Sirix and CopyKat trading platforms are very popular. Go see: CMTrading.com. If you already have a trading account with ETX, please write your experience with this broker in the comments section below.